When you have to write a speech, it pays to organize your writing backwards. Consider your goal first and write the conclusion, then the rest of the speech. However you felt about your first speech, don’t wait to do your second. You may feel like you bombed. You may have gone over time, under time, mumbled, wanted to vomit, couldn’t breathe, had the shakes… Stage fright. But don’t wait. 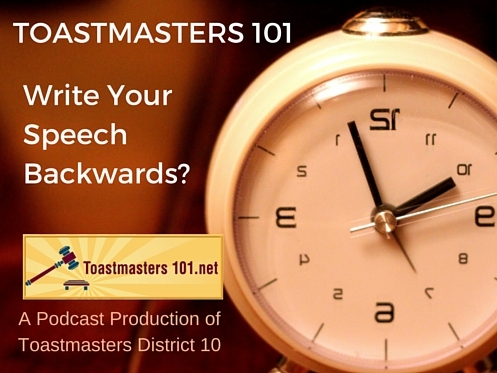 Do your next speech as soon as you can get on the schedule. If you wait, you’re more likely to work up a worse case of nerves for the next speech. Start at the end. What do you want the audience to do? You’ll keep on track as you’re writing your speech. You’ll find your introduction practically writes itself. To organize a speech, determine your topic and what format will inform your audience. Stories are best chronologically, but material with lots of numbers may be better presented in related groups or categories. You’ll develop the ability to determine if you’re going to do a comparison or a straight narrative with time and experience. The key with this speech is less about the material, more about the methods of presenting it. You don’t have to dive deep into the library or Google for material to organize – the more specific you are, the easier a speech is to write. Consider your audience’s expertise and organize the material at their level. When you have lots of material to cover, having a plan will make your writing simpler and quicker. Organize your material in only three categories. If you have more than three, eliminate the excess. A five to seven-minute speech doesn’t give you enough time to cover more material effectively. Be very choosy and deliberate in the decision-making process. It’s easier to add material if you’re short than it is to edit it out later. That sounds backward, but it’s often true. You’ll practice and practice, trying to cut the time down but all you’ll do is end up going too fast. A well-organized, backward-written speech will probably inspire a good introduction. You’ll want something that will give the listeners a good idea of your topic and your purpose, but you don’t want to be boring and tell them what you’re going to tell them. Try for some mystery! Try to whet their appetite with a good story or question before you begin the body of your speech. Next episode – exploding snowman! You don’t want to miss it! Subscribe to our podcast through your favorite podcast app. If you’d go to iTunes and give us a review, we’ll be ever so grateful!